In addition, I have numerous SD and Micro SD cards I toss around like Chiclets. Oh I’ve tried to control myself, but there is no hope for me. In addition, I live dangerously. I jab and yank USB flash drives and those SD cards in and out of the PC like crazy. Windows has a humorous feature you can click on called “Safely remove hardware and eject media”. Why that’s just sissy talk, partner. If they didn’t want me to remove it of my own accord, they should lock those suckers in, like floppy disks and DVDs. So it is inevitable that on occasion I prematurely yank my, uh, media. This happened earlier this week to me with the 16GB SD card that I use for my newest camera. Upon reinsertion later I received the dreaded “not formatted…would you like to format now?” message. Craps. The file table on the media got corrupted due to my reckless and rebellious ways. You should know that if you’re drive is corrupted, NOT to format or even try to write any data to the drive. Any data you write to the drive will most likely over-write any existing data. So after you’ve moved onto the next stage of grief and accepted that it happened, it’s time to review the options. My full time job is with a computing company and I have been in the business for many years now. During this time I have been assigned to recover data from other individual’s PCs. I also have had full hard drive crashes in the past on my own equipment. Nothing beats a good back up system. This should not only duplicate your data, but do so in another physical location. A fire, tornado, or other natural disaster can easily wipe out all copies of your data if stored in the same location. All digital media will fail over time. But like a printed picture that fades, it is possible to recover much of it in many cases except where a full mechanical failure occurs. With magnetic and digital storage we are in an age where we will lose so many images, videos, and other stored data it is astounding. We have printed books that have survived thousands of years, but optical discs and hard drives have a much shorter shelf life; measured in decades and even down to less than a few years under certain conditions. Even a perfectly functioning hard drive that was removed from a PC and stored in an airtight container will lose its magnetic properties (and the resulting data that is stored) over time. Our children and their children will never have the experience of going through photo albums like we have. Even printing your pictures out will not stave off degradation; home printers don’t do a good job of archival quality printing. So lets circle back to my situation if we can. My SD card is no longer readable. In the past I have used an application called “recuva” successfully. In general, if the USB device, SD Card, or hard drive can be “seen” by the PC, I can recover some amount of data. The drive doesn’t have to allow me to explore it, it just needs to be identified as a device by the PC. I was unable to successfully recover any data with “recuva” with this media, so I began looking for alternatives, using those alternatives, and then moving onto the next. I finally came across a great application. I’ll preface the mention of its name with the statement that I have no connection with the company and will not get paid for promoting it. The software is called “Zero Assumption Recovery” or ZAR. You can Google it and download it if you like. If you do, and it helps you, post a comment below and let me know. It is completely free to use to recover pictures, but to recover other data you much purchase a license. It works, very well. Nothing is perfect though, I did lose a handful of images, but it recovered greater than 95% of the pictures on my card. The only downside, and this is true for all recovery solutions that I know of, is that when the file tables are lost, so are the file properties. This means the file name and date of the picture are lost. You will get a numerically increasing list of names, and the created date will be the date the pictures are recovered. They may also not be recovered in the same order as they were taken. This is caused by how digital storage functions. If you have 100 pictures stored on a flash drive and you delete 3 pictures somewhere in the middle (we’ll say picture #49, 50, and 51 for this example) then a gap in your data exists. Unless you perform a disk defragmentation picture number 101 will be stored beginning in the space where picture 49 existed. You shouldn’t defragment flash drives often, due to the fact that there is a limited number of read/write cycles that can occur on flash-type media. Over time, deletion of files mixed with creation of new files will cause a drive to be very fragmented. While the original sequential file names and/or the created date property that is marked on the file make sorting easy, a lost file table causes the recovered images to be out of order. The more times you have deleted and written new data, the more that this disorder will occur. The above paragraph is a long way to say that while I as relieved to recover my pictures, they were out of order and there was no method to sort them other than to view each one, change the filenames manually, and put them into subfolders for organization. I had worked through about half of them over the period of a couple of days when like being sucked into a time warp, I did the exact same thing again. The good news was that I had already backed up all of the files onto my hard drive. The bad news was that all of the file-renaming and organizing was being done on the card that got corrupted again. So another couple of days was spend meticulously naming and organizing my pictures a second time. This is my long, but true, explanation for why I haven’t posted much in the way of reviews in the last week. If you got this far, here is something for you. Indirect smoking is the method of cooking where the wood is burned in a separate chamber from the cooking. The smoke and heat then flows over the meat and exits through an exhaust stack. With direct cooking, the heat source is directly underneath the meat. With BBQ the heat source is usually coals which can be reduced from wood in another “pit” that is dedicated for the purpose. This cooks the meat much faster than indirect smoking, but can still provide some great BBQ and can be better than many smoked offerings. With faster cooked meats such as port ribs or sausage, the different is minor. 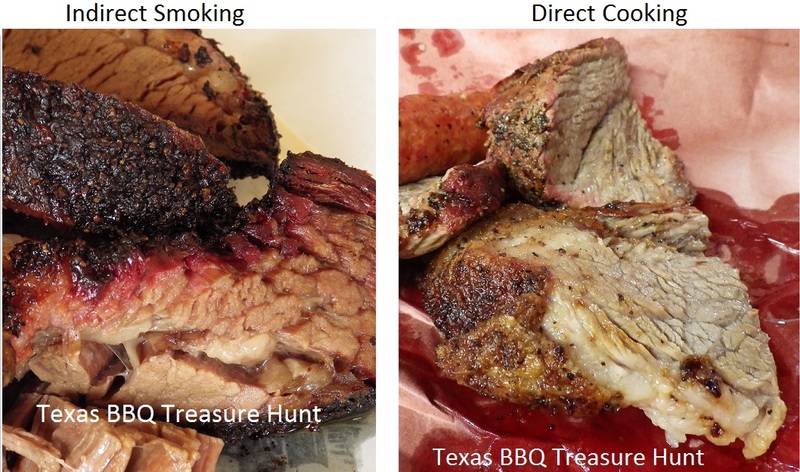 But with brisket there is a distinct different between the two cooking methods. In my opinion however, the best true indirectly smoked brisket will always be better than the best direct cooked brisket. Below are two visual examples. If you’re the first person who can guess correctly which two locations these are from, I’ll buy you lunch. Seriously.